If you could go back in time and order one - the very best combo of options, what would you buy? How would you equip? Lots of variables, I know. What's your unicorn? ...and Why?? 1LE with aluminum hood, or loaded up with T-tops or Leather? Kind of hard to pick just one. So what does that leave? 89-92, Formula, T/A, or Z28/Iroc. L98 is pretty much a given, but LB9 5spds considered. Maybe a nicely equipped 90 T/A hardtop, my 91 Formula, an 89 Iroc, or a convertible with some mods. Firehawk? Something like that. Those are good choices. Keep em coming. 1983 Z28. Red w/ silver ground effects.5.0 H.O. 5spd.3.73 posi. T-tops.Black interior. Or 1989 GTA Black w/tan leather 5spd 5.0 TPI.3.45 posi. I Did 33 Years Ago With What Was Available From GM At The Time. 1985 Z28 (I'd rather have 86 but the production on it was not obtainable) 5.0 H.O. 5 speed 3.73. White w/gold gfx, tan cloth interior. No options other than suspension goodies. Crank windows, no A/C, no t tops. Cheapest radio if I can't buy radio delete. And after that I'd start modifying. Warranty be damned. Exhaust gone for real stuff, that sorta thing. Hopefully I'd break the 305 to put in a 350 in a similar vane of the H.O. For me absolutely the 89 Turbo T/A and a 92 Firehawk. I need to win the lottery I guess... would even buy them today and restore them fully to new condition. If I could go back and order one from a GM dealer, I'd pretty much order the car I have but I would get it with the 5-speed and 3.42 axle.. G92.. That was all that was missing from mine but wasn't a deal breaker.. 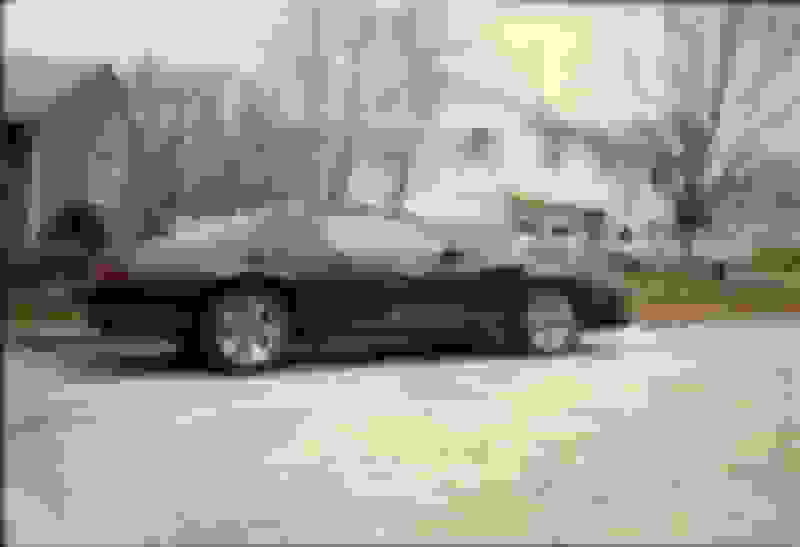 I would also like a 1989 IROC black 5.7 with T-Tops and gray leather.. obviously loaded TPI car with 16" wheels, and 3.27 axle.. I would like either the red decals or blue/silver combo.. not a huge fan of the gold.. not a fan of the red interior either.. looks good new but doesn't age well.. I like the metallic colors and black.. I think it shows the shape of the car the best.. I don't think I could do white.. there were too many fire engine red ones around me, and I was not a fan of the canary yellow ones.. I prefer the 80s interior to the airbag wheel on the 90..
One thing I like about the Verts is that you don't have to worry about the eventual headliner falling apart.. but there are a lot of cheap plastic parts that are hard to replace being so rare.. It would have been awesome if they made a special edition Turbo IROC Vert with 3.8 turbo from the GNX or even a special edition 5.7..
My unicorn is a not really spectacular per say, but today, it's extremely hard to find one! My dream third gen is a black hardtop iroc with decal delete, black interior, 5% tints with a monster 350 with a nasty can with some pop to it, and t56. No desire for a stocker they're too slow lol. Know something funny? I Pretty much hate ttops but my car has them lmao. if i was going back in time and walked into a dealership to buy a daily driver type third gen it would be a 92 black z28 with gray leather 5.7 auto or 5.0 5 speed with ice cold ac ..
Its a hard choice. There's so many. 1. 1988 Firebird Formula early production Yellow with black trim 2 tone color with the LB9 MM5 G92 combo, with no options except tilt lever, radio and A/C. never found one with this color before with those options. 2.1988 IROC-Z Grey Metallic LB9 MM5 G92 with ttops since it was the last year for ttops and G92. With leather/cloth deluxe seats with all power features. 7.1992 Firehawk competition package with 366 rodock engine 375 HP motor. If it was a few years earlier and I had to have one I would probably go with a 85 Trans Am black and gold trim with gold colored convex 16 in wheels 4 wheel disc brakes L69 4bbl HO 5 speed 3.73 gear combo with optional bird decal on the hood with ttops with every option interior wise including the racaro seat interior option and aero spoiler that was introduced as optional that year. 1. 1985-1986 Trans Am L69, T-Top, Recaro, Digital Dash, WS6, Red or Black, UQ7-UT4, Louvers, Hood Bird (Plus every interior option). Would Also order a locking trunk lid, and "Trans Am" splash guards from the dealer and have them Installed. 2. 1985 Iroc Z28 L69, T-Top, lear siegler, Sliver or Yellow, EQ head unit, Center console clock, (plus ever interior option), Rear wiper. Would also order locking trunk lid, Louvers, "Z28" Splash guards, Head light louvers, and a 140 MPH "Z28" gauge cluster from the Dealer and have them Installed. These are also my goals for my cars. Have all the parts. Well, my cars are LB9s due to how L69s are beyond Rare. Plus My Iroc is a hard Top, But not for long. Gonna find a CnC car and swap Roofs. Unless there is someone out there who has a very highly optioned 85 Sliver Iroc, with T-Tops who wants to trade for a hard top. I got to do the same - 5.0 TPI/5spd/G80/G92/J65 with power windows, locks, tilt, t-tops, grey custom cloth interior & tuxedo black exterior. Was my dream & still is. I would say the Holy Grail of third gens is a 1986 third gen equipped with the L69, and a 5 speed. It's so rare, nobody has actually seen one. Brand new with zero miles? Hhmmmm thats pretty easy for me. This might sound odd, But as a 2nd, I would also love to have my own 1987 iroc that I own right now as brand new. Not because the car is worn out, because it is not. But, I would enjoy having that seem feeling that I had when I used to drive that car when it was only 4 or 5 years old. That was just an incredible experience. I drove the car again this summer & while its still a nice solid car, it doesn't give me the same excitement it did when I was in my early 20's But, thats kinda true with a lot of things as a person gets older. Lots up in Canada. :-) Came with a cage and side exhaust. For me the 86 Players car are the grail. Only car that GM delivered with a cage in it. First car to really create the need for big brakes. Changed the 5 speed to have the lower overdrive. Racing breeds better quality production line items. For other holy grails ... first appearance of something is cool. First Vert. First 1LE. First firehawk. How I wished they kept the Turbo V6 after 89. Or how cool it would have been for the anniversary camaro to actually come with a 6 speed. Firehawk was sorta the best of those rare cars. I've never been wowed by the rarity of a specific car, regardless of make and model. I mean, I'm glad people DO own these cars, and that they're preserved over time, but I've never desired to own one. I DO have favorites, but nothing more than my preference of color, or year and trim model of one year over another. If you're asking what I'd order NEW....if it would show up on my doorstep today? Sheesh...Beechwood on Bright Red or Blue, Maybe Red interior on white....89 Iroc, T5/LB9. Was Gonna say with T Tops, but maybe a 1LE instead. Hardly a unicorn car, but it's what I'd get. I'm not surprised the majority of peoples pick are the 5.0 HO or TPI 5spd combos. What a fun car to drive. There seems to be a pattern, for sure. I'd order a convertible (any model) that came with the light bar. Then I'd go to the parts department and order as many replacement light bars that my garage could hold. The part that sits behind the front seats and crosses the car. Well... It's good to see Cardomain is still completely horked since they did their "mobile device compatibility" update. They had to see their numbers go up in smoke. Kinda funny how it pretty much went away overnight, and they never considered just restoring a back-up. I will take the "Factory" definition a little broader here. 91-91 SLP Firehawk with every box checked on the order form. No reason to go with anything but that car for me. Since the car could be ordered from a GM Dealer, I'm counting it as factory. I love my car, but if I could have had my way back then, get a 1986 Camaro Sport Coupe, fully loaded, 4 wheel disc brakes, 3.73 rear end, All IROC equipment including the lower control arms for the 16" wheels, (and here's the part where I'm gonna get yelled at) have an Iron Duke engine installed with a 5 speed behind it. In light brown metallic. Last edited by 3rdgenparts; 11-13-2017 at 04:20 AM. Can I be the first to say BERLINETTA? :P No love for the Berli? I'll take a 1986 one, white with carmine red interior. t-tops, factory louvers, every option if it adds a switch to the center console I want it! Really wishing I had a rear defrost this time of year I just want to take it cruising everywhere, a 305 with Auto is enough for me Good sound package, overhead console, etc etc just a real nice car to enjoy, I'm gonna own one one day! So when can I expect my cars to be dropped off? 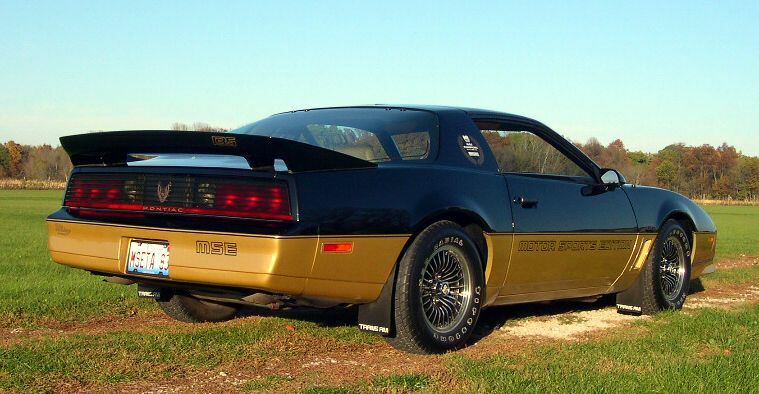 I’d like a 1984 black and gold, fully loaded, t-top mecham Trans Am. The one below is an ‘83 but same thing. Last edited by battmann; 11-11-2017 at 07:50 PM. Not sure how much of a holy grail car this would be, but how about a 1985 California IROC edition? I would have to say. 1992 purple haze rs convertible with a 5 speed. Air cruise tilt power doors windrows locks etc etc. Mostly after the convertible in that color with a stick from the factory. Haven't seen one. I think it's really hard to pick just one car alone. There were so many features along the way that I liked. The red or blue stripe along the earliest Z28 cars. I'd like a black Firehawk. But without the slanted front bumper. I didn't like them then. I don't like them now. Ditto the non-flat doors. Those always seemed like dust catchers. 1LE always seemed like a neat option when I lived in Canada. Living in Texas, the thought of purposely buying a car without A/C seems insane. The 1st style of IROC wheels were always my favorite on the Camaro wheels. That obviously wouldn't work on a Firehawk. I'd probably have to go with a Player's Challenge car though. The right options for the time. And I used to love going to watch the races back then. I'd go for a California IROC with black paint and interior. What makes a California IROC special or unique? My biased opinion would be the same car I own but a vert, 89 Formula 350 white/beachwood. I seen a picture of one in the gallery on here. A close second would be 89 Iroc vert with a 5 speed. As for the color I would struggle between black or that dark red with gold accents. As for options CD player is a must and I'm good with cloth interior. I'd order it the way I ordered my '89. Yeah, a 1LE would be nice, but then I'd miss the AC, power windows, power door locks and driving lights - so I'd order the one I did. Interesting. A friends of mine bought a RS model Third Gen in CA which I thought was perhaps released there earlier than the rest of the country. Same year and version of car - in black with black interior. LOL, My camp counselor had a purple haze vert back in the mid '90's. Dont remember if it was a 5-spd car ? But I know it was a V8 since it had the 16"
5 spokes on it and he did some "schweeeet" burnouts for us a few times !!! Ahhh........... Summer of '96 Chicago, memories !! !